This product adheres to wood the best of anything that I have ever seen. It never seems to crack or pull loose. I have been using it for the last fourteen years and have not experienced ANY problems with it. It is tough, elastic enough to "give" some, and super strong. It is a truly great product. I have been using this for almost 10 years now. I have had to redo some walls of my house with the Ultra line finish and touched up the chinking. Color consistency over the years is amazing and the durability of this product is exceptional. Goes on so easy and can be worked with simple tools and a little water to a great look. I also use the log end seal and that has kept the ends off my logs looking original with no checking or cracking. The north side of my house takes a beating and the ultra line finish is easy to reapply and has protected my logs from the elements. I love this product! We completely restored our log home in 2013 and included Energy Seal as one of the key components to sealing all of our doors and windows. Remarkable product, easy to apply, stained very nicely to match our logs, and still holding true this year! We used Energy Seal when we built our Ward Cedar Log Home. My husband and I did the caulking ourselves and found it to be easy to use and it's lasted a long time. We call it "peanut butter" as it's looks like it and is kind of the same texture! HAHAHA! Touching up places year to year is easy, also. Overall, a very good product. Great product, easy to use looks great. Customer support was very helpful, as I considered to be a novice when it comes to Log Home maintenance and improvements. The tech support was great in setting me up with the correct products and tools I would need to accomplish the tasks at hand. Definitely will continue to do business in the future. Our home was originally built as a “chinkless” log home, but it’s nearly 40 years old now. We decided to use this product while currently refinishing the exterior. Getting the hang of applying it is a little tricky—but that may be because my husband is a perfectionist with it haha! It looks great though and I’m sure that we will see major savings in our heating and cooling bills once we’ve completed this project. The backer rod first and then the Energy Seal takes a bit of practice. We are working from the inside for this winter and then next spring will seal the outside. We read about other company's products but are glad we chose Perma-Chink. My wife and I used this product on the interior and exterior walls of our home. I love that it matches the stain color so you don’t have to worry about it standing out- it blends perfectly. And it seals very well- love that it kind of stretches when logs settle. Now that the weathers warming slightly, we went outside and sealed around all our doors and windows. When we were feeling cold air moving in around them during the cold snap we realized how badly it was needed! Pretty easy to use with the backer rod, and now we don't have any of the cold air intrusion. Overall, I am pleased with Energy Seal. We used several tubes of the Adobe color (matched our log cabin) to caulk around windows, doors, and between some boards near the roofline. It is a little difficult to use at first, but I got the hang of it after awhile. Backer rod was recommended, so we pushed it into the gaps first before caulking. It seems to have worked well so far! I love Energy Seal, there is nothing else that I would use on my Log Home. Nothing else has held up as well, I believe in Perma-Chink products and would recommend them to anyone. One of our neighbors recommended Energy Seal to us for sealing our new vacation cabin in the Sevierville, TN area. We purchased a couple of the small tubes to test it first and now have applied it between our D-logs and around windows and doors. The Golden Honey color matched pretty well with our light honey-colored wood stain. In some of the gaps we used 1/4 inch waterproof masking tape as a backer, as needed. We are very pleased with this product! Very pleased! I used it to fill in several Carpenter Bee holes after treating them and this caulk blends in well with the logs. Brian ( at the online store) sent me a document about dealing with Carpenter Bees and it listed several products which included Energy Seal that I could use. I think this caulk will work. We purchased a couple tubes of Classic Brown to fill in few gaps between the logs. It was not dark enough, but we purchased a few more tubes of the Walnut color and it matches our logs MUCH better! We painted over the Classic Brown, so it matches a little bit better now. After completing a web training with Perma-Chink, we took on sealing our "chinkless" home and it went really well. The product performed exactly the way Gabe in the Redmond store said it would and with his help and extra tips, we are extremely happy and the home is much more airtight. Easy to apply log home sealant from a company that's been doing this for many years. Great customer service and quick shipping. Great experience! This Energy Seal caulk is a little hard to spread at first with a spatula, but we got the hang of it after awhile. Be sure to use a spray bottle to mist it and then smooth it. I recommend looking at the document on the website about Energy Seal application before starting. Overall, I am pleased. It was a lot of hard work, though. I ordered a 30 ounce tube of Energy Seal from your online store and used it to caulk/fill in gaps around my window frames on the outside. The color I used (Cedar) looks great and blends in with the stain pretty well. I would probably get the smaller tubes if I need this product again since the 30 ounce tube was a little heavy to handle when caulking. Very easy to apply for a do-it-yourselfer. Instructions online with permachink were clear. Astonished at how fast I received the product. Ordered twice and got the large pails the next day both times without expediting shipping. So glad I found Energy Seal, it is exactly what my log home needed! I have a Swedish Cope style log home that my builder said would never need a sealant, well after 3 years I started to realize he was mistaken. 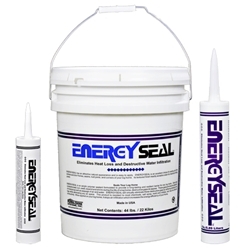 No more draft and better energy efficiency with Energy Seal Sealant!